ALBUQUERQUE, NEW MEXICO -- In February, when Anna Hall was walking around the the convention center in Albuquerque during the USA Indoor Track and Field Championships, all she wanted to do was meet Kendell Williams. 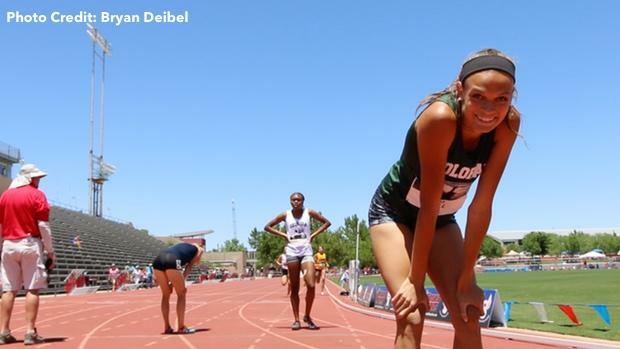 The junior from Valor Christian (CO) High had looked up to the multiple NCAA champion in the heptathlon for much of her track and field career and someday hoped to replicate the Olympian's career on a national stage. But it wasn't in the cards. Instead, while Hall, 17, was competing in the high jump, her teammates from FK Elite met the University of Georgia star around the grandstands. After Friday, maybe that meeting needs to be rescheduled. 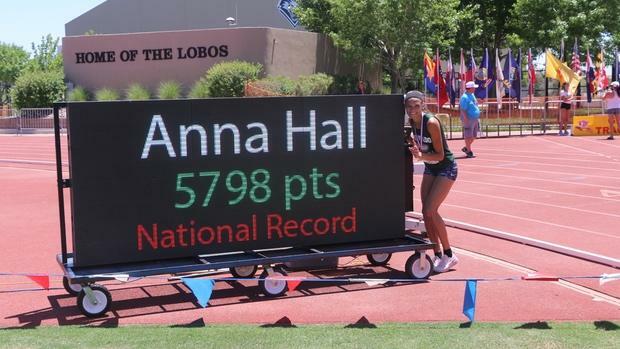 Hall surpassed William's high school national record in the heptathlon from 2012 at the Great Southwest Classic, scoring 5,798 points across seven events over two days at the University of New Mexico. Williams set her national mark of 5,578 points during the World U20 Championships in Barcelona, Spain. Hall finished with a blazing finish in the 800m on Friday, crossing the line in a new PR of 2:17.18. "It felt really good to put it all together," Hall said. "I was really disappointed with how last year's season went, hep wise. I would hit like one event really well and then I would do absolutely horrible in another. It was just up and down. "Emotionally, it left me with a really sour taste in my mouth. So this year I came into this and said, 'I'm going to break the curse in every event!' I'm not going to hold back and I'm not going to have a bad one." She accomplished several personal records throughout her series, including a 10-inch best in the long jump (6.06), a best in the javelin (35.96), a best in the 100mH (14.03), high jump (1.82) and in the 800 (2:17.18) at altitude. Her long jump (19-10.75) is a new US No. 7 mark, and her high jump, a best at 5-feet-11.5 inches, is US No. 5. Closing in on the record on Friday, Hall found another gear in the final 50 meters of the 800m, passing Marietta (GA) senior Sterling Lester, a Georgia recruit who finished second with 5,270 points -- Hall split her first 400m in 1:08.23. "I remember seeing her at indoor nationals," Hall said. "I said to myself, 'I'm coming right out the gate with my hurdle PR.' I brought that same attitude into this. She got me off to a really good start. If she wasn't in my heat, I don't know if I would have ran that fast in the hurdles. That set the tone." Making the day even better, Hall accomplished this feat on her father's (David) birthday. She celebrated the accomplishment by taking a picture with him along the national record board. Her mother, Ronette, wasn't far away, snapping photos with her iPhone. Hall exceeded all expectations, doing so while being watched by powerhouse college programs, among them the University of Oregon. The former meet record at Great Southwest was 5,522, set in 2008 by Ryan Krais. Hall will return to the track on June 15-17 at the Indiana University for the USATF Junior Track and Field Championships. She'll return to the heptathlon where she'll hope to qualify for Team USA's U20 Championship squad.